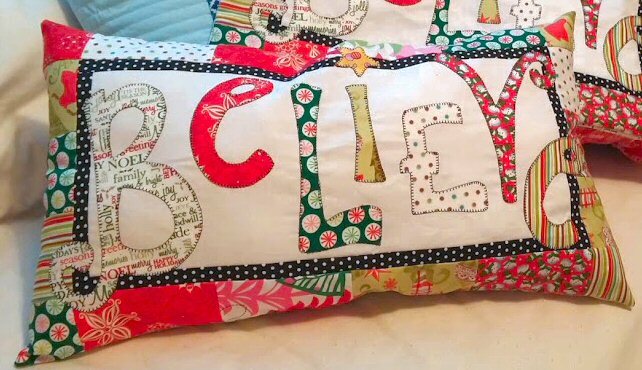 One item that I kept seeing on my Stocking Swap partner’s wish list was holiday themed pillows.. which means this was a great excuse to finally sew up the Believe pattern I purchased last year (and never used). This pattern is by same designer who created the Personalized Name Pillows that I love to sew so much – so I thought I would enjoy whipping up a couple of holiday versions (one for the swap, one for a gift)…. I was wrong. I didn’t like this project at all. First off, I had a harder time finding Christmas fabrics that worked well together. I think it might be easier to tailor material for the name pillows because there is a lot more variety, it’s just harder to find a bunch of holiday prints that coordinate (and isn’t heavy on the reds and greens). Secondly, the construction process is different: The name pillows are designed so you apply random cuts as the border while this pillow has an additional border and specific ‘sizes’ you have to cut for the patchwork (I like the more ‘free form’ cutting better.) Lastly, there’s lots of appliquing involved. While I usually like this part, I found the swirly lettering a bit more difficult (especially for my usual blanket stitch style) and just not as much fun the second time around. The end result is very cute. I am needing more fiberfill to give this a nice firmness, but otherwise this project is DONE. Thank goodness. This entry was posted in General on October 28, 2014 by stacy. Well, it may have been a pain in neck, but the outcome is super cute!